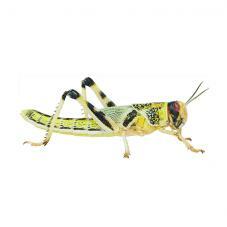 One of the most exciting animals available to reptile enthusiasts. These exotic pets have proved hardy, easy to maintain and a great starting point for someone wanting to keep their first pet reptile. A medium sized gecko, with adults reaching a size around 25cm (8”) snout to tip of tail. They have a triangular shaped head and two rows of spikey-like scales which emerge above their eyes and run around the edge of their head and along down their spine. This gives them the appearance of having eyelashes, and is the reason they are sometimes known as “Eyelash Geckos”. A long, slender and semi-prehensile tail make up half of the gecko's total length. 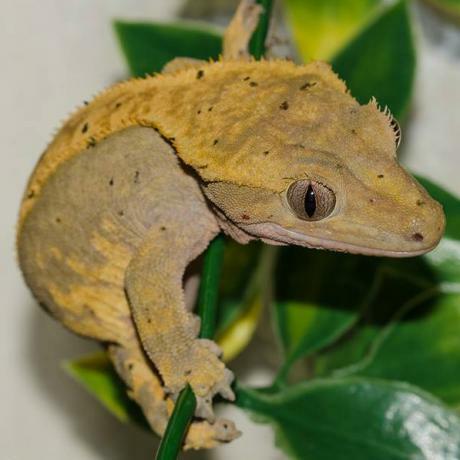 Naturally in the wild, Crested Geckos are often tail-less, even captive specimens under optimal conditions can easily drop their tail if they become too stressed, handled roughly or even during breeding attempts. Their skin has a soft and silky appearance and is predominantly made up of colours of brown, grey, red and yellow. They can display varied patterns including bands, blotches and spots. Selective captive breeding has also produced some well known morphs such as “Flame” and “Harlequins”. Crested Geckos have adhesive pads on their feet made up of lamellae, much like many other arboreal species of gecko. Lamella consist of millions of tiny hairs which allow the gecko to climb or cling to any surface, including glass. Sexing can be achieved once the animals reach a few months of age. 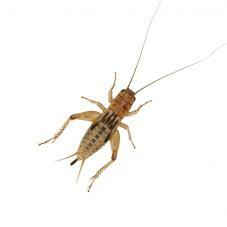 Males develop a characteristic hemipenal bulge at the base of their tail. 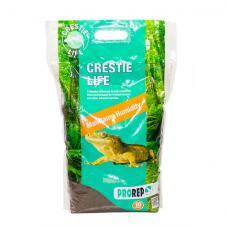 Where are Crested Geckos from? In the wild these lizards are found in the tropical rainforest of New Caledonia. Among them are several Rhacodactylus sp. all endemic to this region. New Caledonia consists of a group of islands located off the northeast coast of Australia in the southern Pacific Ocean. The largest island in New Caledonia, Grand Terre, has a mountain range that extends straight down the middle. This creates a natural weather barrier, leaving the east side of the island wet and humid and the west side arid and dry. Naturally, many of the gecko species of this region are found on the east side of the island, among dense tropical vegetation. Crested Geckos thought to be extinct, were rediscovered as recently as 1994 in an expedition to the Isle of Pines led by Robert Seipp. 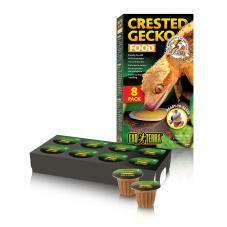 How do you keep Crested Geckos? Being arboreal lizards (tree dwelling), enclosures provided should be vertical rather than horizontal and with a minimum height of 60cm (24”) for an adult. 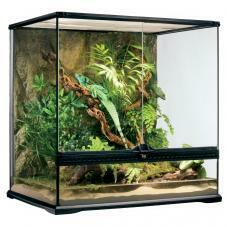 This will allow the gecko ample room to move around, glass terrariums work best for housing Crested Geckos. Hatchling and juvenile geckos can be housed in smaller faunariums for rearing purposes. Daytime temperatures should be maintained between 21-25°C (72-78°F) during the day, but with a small night-time temperature drop. As always, temperatures are best controlled with a quality thermostat to prevent overheating. 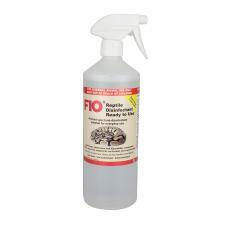 Maintain a humidity level of 70-80% by spraying the enclosure thoroughly with tepid water, including décor and substrate at least every other day. Often you will see these lizards actively drinking from cage décor as you spray their enclosure. Ensure you provide a suitable sized water bowl for drinking. For cage décor, provide cork oak branches or bark, combined with vines and live or artificial plants. Ensure you fill out the enclosure well, to provide plenty of coverage and so that your gecko feels secure. Use a soil based substrate to cover the floor of the enclosure and add sphagnum moss for decoration and to help raise the humidity. Juveniles and adults can be maintained entirely on a complete and quality based meal replacement powder diet if you wish. 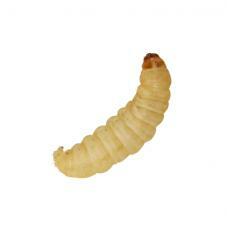 Alternatively, you can provide them with a dietary fruit meal replacement supplement and still provide feeder insects. 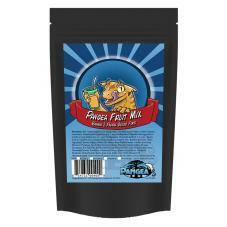 If a complete meal replacement powder is not used then you must use a good quality dusting powder to provide essential calcium and vitamins to your Crested Gecko. 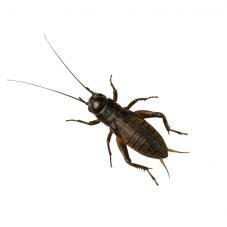 The traditional method of application is to use a spare live food tub or empty cereal container to coat the insects lightly in whichever dusting powder you are providing. 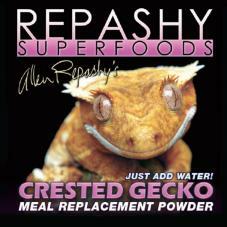 We’d advise dusting your insects on every feed when your gecko is growing but to alternate between calcium and vitamin powders with the ratio of (2.1).